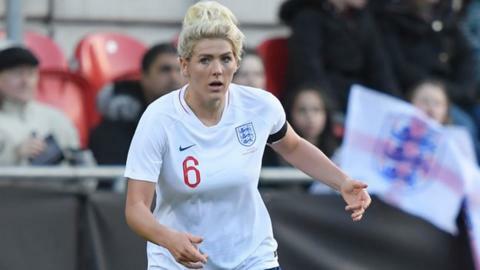 Chelsea's Millie Bright and Manchester City's Jill Scott have returned to the England squad for next month's friendly matches against Canada and Spain. Defender Bright, midfielder Scott and Reading midfielder Jade Moore missed out on the SheBelieves Cup win earlier this month because of injury. City goalkeeper Ellie Roebuck is also in Phil Neville's 25-player squad. England face Canada at Manchester City on Friday, 5 April before hosting Spain at Swindon Town on Tuesday, 9 April. Both games are part of England's 'Road to France Series' and will be broadcast live on the BBC. The match against Canada - who are fifth in Fifa's world rankings, one place behind England - will take place at City's 7,000-capacity Academy Stadium and is already sold out. Head coach Neville said: "We're looking forward to playing in front of our fans in different parts of the country once again. "Our support is brilliant. The fans have backed us and hopefully we can put on a good show. "As ever, picking the squad was really tough due to the strength and depth of talent in our ranks. "We have four matches before flying out to France and I want to emphasise that the door is not shut to any player with ambitions of making the World Cup squad." Bright, 25, and Moore, 28, and Scott, 32, all missed out on the SheBelieves Cup win in order to manage their fitness before the World Cup which starts on 7 June. England will also host Denmark on Saturday, 25 May at Walsall before the visit of New Zealand on Saturday, 1 June at Brighton and Hove Albion.